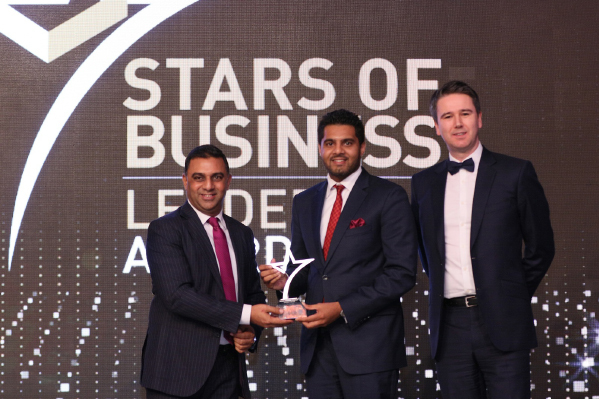 Mr. Akbar Moideen Thumbay, Vice President of the Healthcare Division of Thumbay Group, was awarded the ‘Leader Shaping the Future Award’ at the prestigious Stars of Business Leadership Awards 2017 on 9th November, at JW Marriott Marquis, Dubai. Mr. Akbar was chosen for the award on the basis of his role in leading Thumbay Group’s healthcare division on the path of success, the remarkable growth achieved by the division in recent times, and for demonstrating outstanding leadership capabilities and entrepreneurial flair. Expressing happiness on the recognition, Mr. Akbar Moideen Thumbay said, “Thumbay Group’s businesses, especially the healthcare division is going through an exciting phase of growth and global expansion right now, in accordance with the strategic plans developed by our Founder President, Mr. Thumbay Moideen. We take pride in every recognition that comes our way. These recognitions motivate us to accomplish more,” he said. The Stars of Business Awards are the most prestigious business accolades in the region, widely respected for being objectively judged. For over a decade now, the awards have been focusing on recognizing companies and entities for their growth, achievements, aspirations and position in the market. The 2017 edition of this award was focused on recognizing the achievements of visionaries who use their leadership skills and innovative thinking to drive an entire team forward with them, according to the organizers. Established by the Founder President Mr. Thumbay Moideen in 1998, today Thumbay Group is a diversified international business conglomerate with presence across 20 sectors of business including Education, Healthcare, Medical Research, Diagnostics, Retail Pharmacy, Health Communications, Retail Opticals, Wellness, Nutrition Stores, Hospitality, Real Estate, Publishing, Technology, Media, Events, Medical Tourism, Trading and Marketing & Distribution. Thumbay Group follows a strategic plan, according to which the Group aims to expand its businesses over ten times, with global presence. The strategic vision plan aims to increase the employee strength to 25,000 by the year 2022.